This is the second half of my Christmas day journey across Ohio, guided not by Rudolph, but perhaps by St. Gawker, the patron saint of aimless wanderers. I had headed east from Columbus and had just now reached the mighty Muskingum River, the major Ohio River tributary in eastern Ohio. 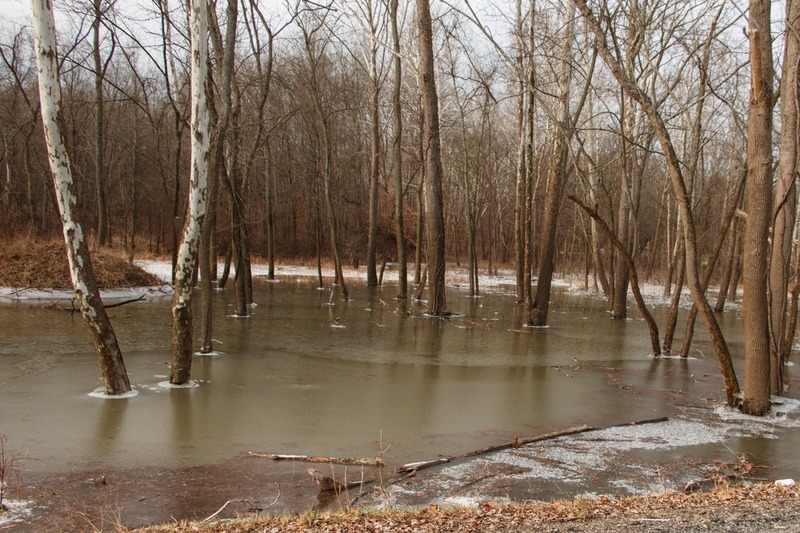 I found the river to be somewhat flooded, as much of the state was, thanks to rains and snow melt. 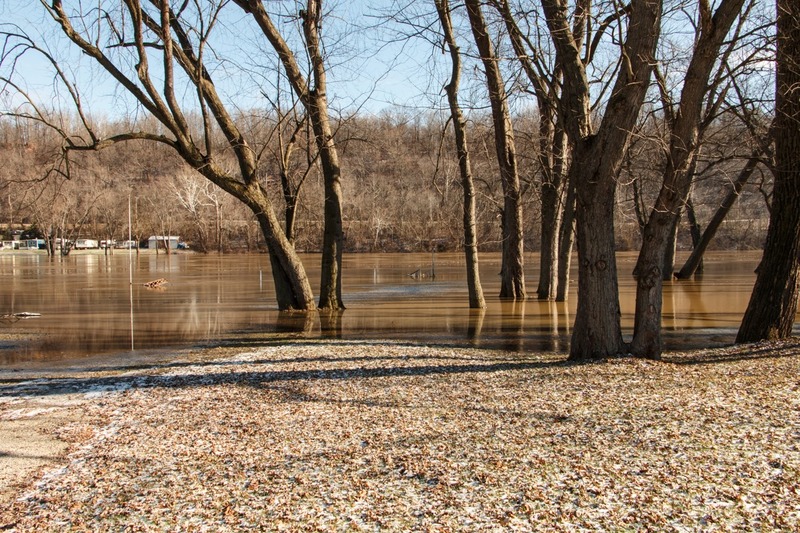 Here, a few miles north of Zanesville, it was swollen past its banks. The flowing river kept it from freezing over, though this would not be the case elsewhere where there was non-flowing standing water. 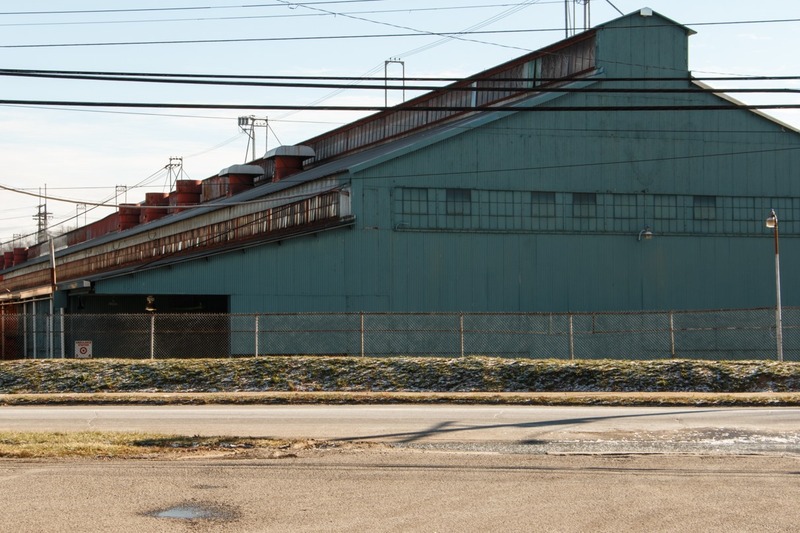 It is nice to find an industrial plant in eastern Ohio that has not been demolished or shuttered, or soon will be so. 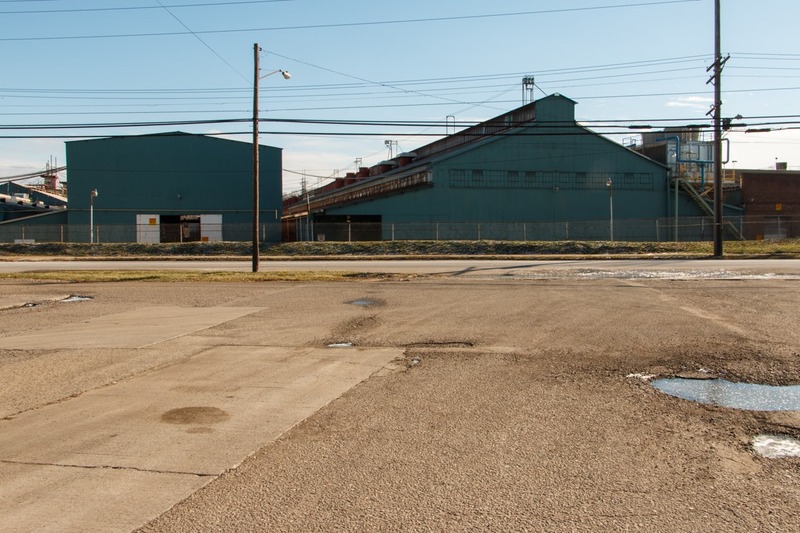 This is the AK Steel Plant in Zanesville, along the Muskingum River. It produces flat-rolled steel (carbon, stainless, electrical) for automobiles, manufacturing, and construction. 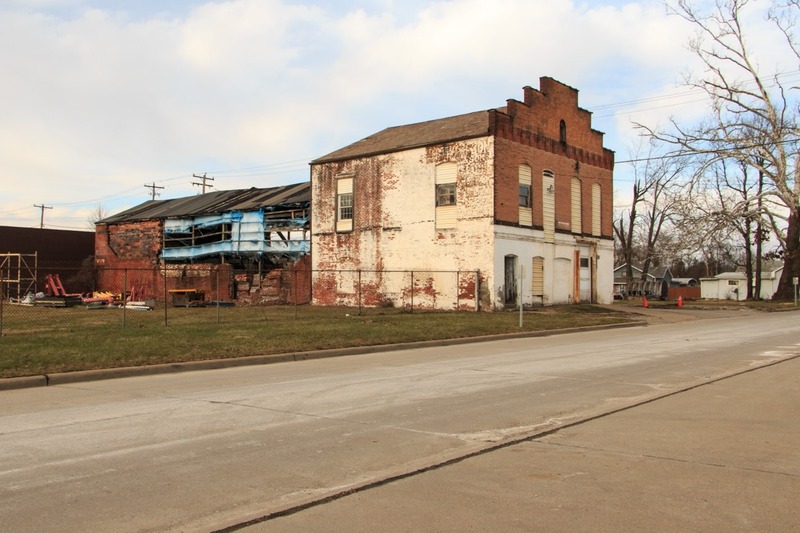 AK Steel began in 1899 as The American Rolling Mill Company out of Middletown, Ohio. It survived the downturn in the American steel industry by partnering with a Japanese steel company (Kawasaki Steel Corporation, the “K” in AK Steel). The jobs (a couple hundred) are great, but sadly, some AK Steel plants have been serious polluters. I’d love to see the inside when the plant is operating. 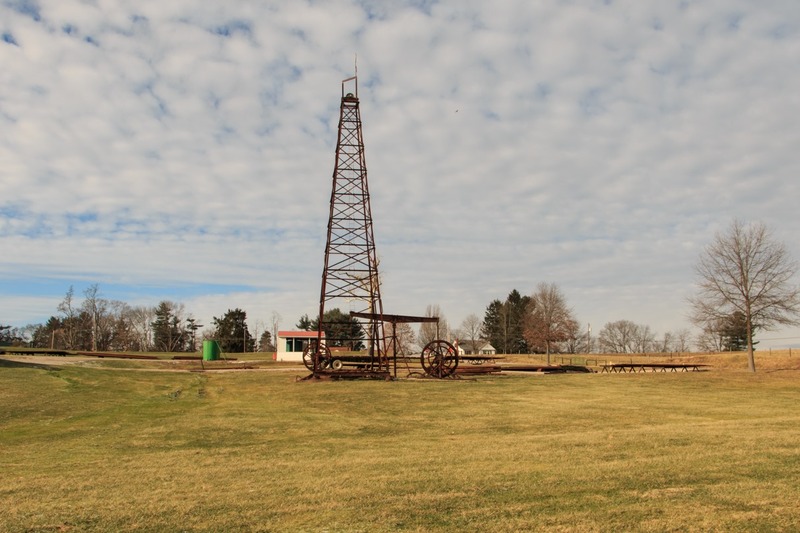 I was surprised to come across this antique oil well setup northeast of Zanesville. I think some sort of oil rig company may be based on this property. 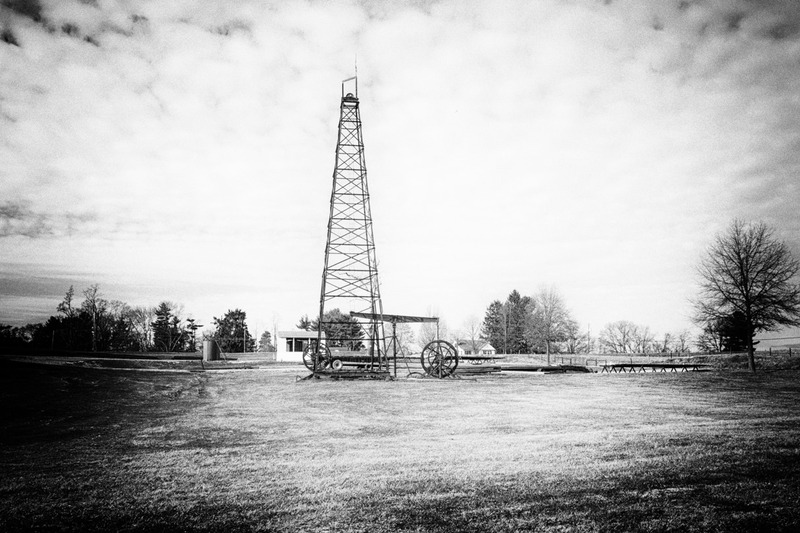 This scene seemed almost designed for a black-and-white photograph to take the viewer back to a bygone century. 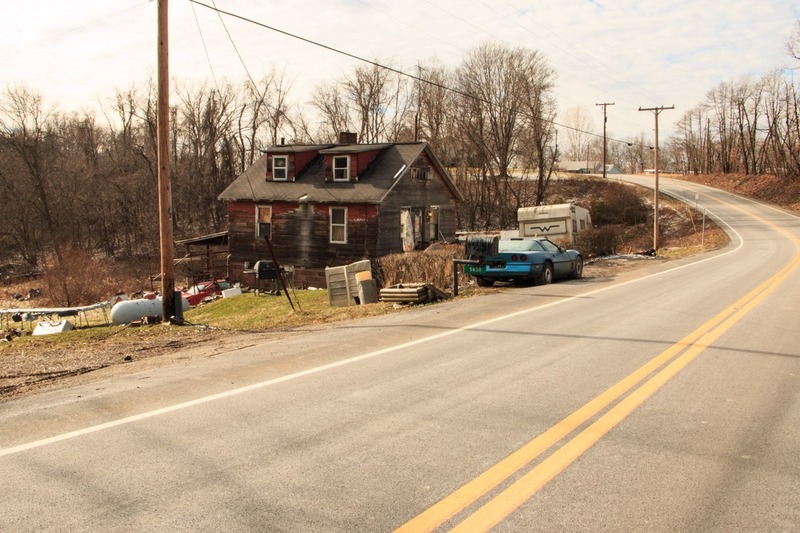 This tiny ruined house looks a bit odd, but is appearance becomes more clear when one realizes that this house does not have any brick in it—only siding designed to look like brick. It is actually a wooden plank house. 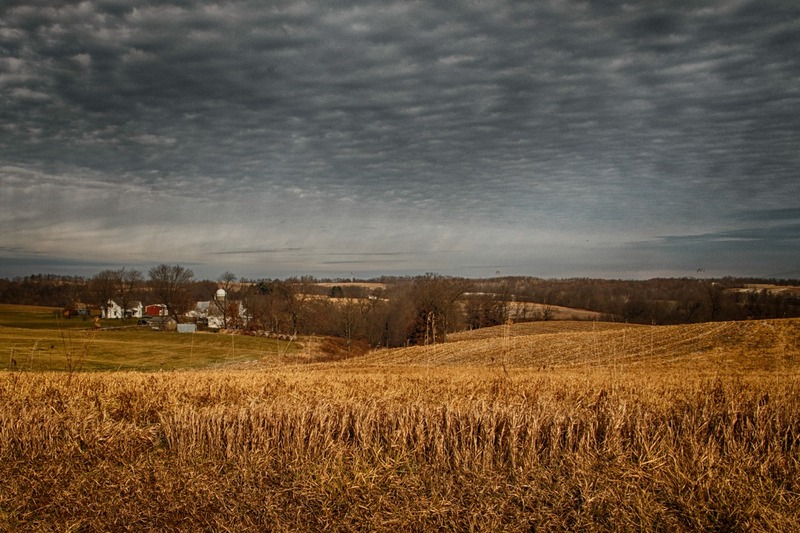 A prosperous farmstead under a grim sky. The photograph is pretty processed; it actually wasn’t nearly so ominous. 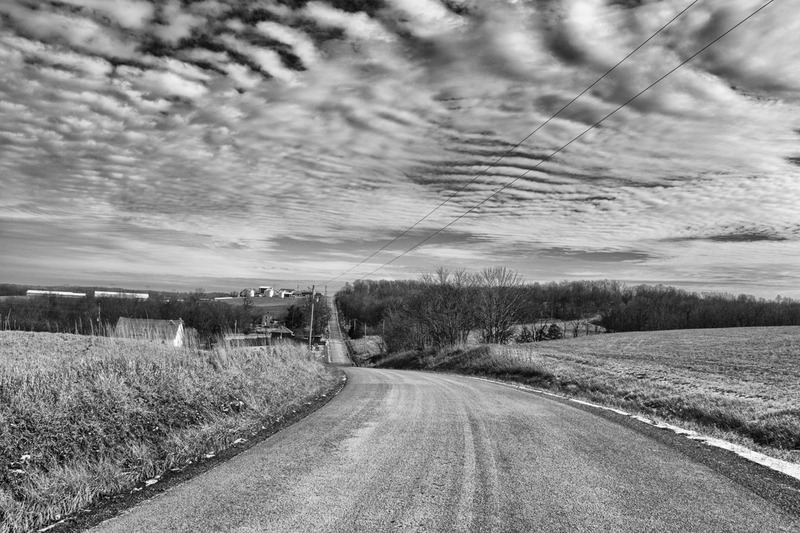 This road view shot is a great example of how black and white photography can really help bring out the texture in the sky. 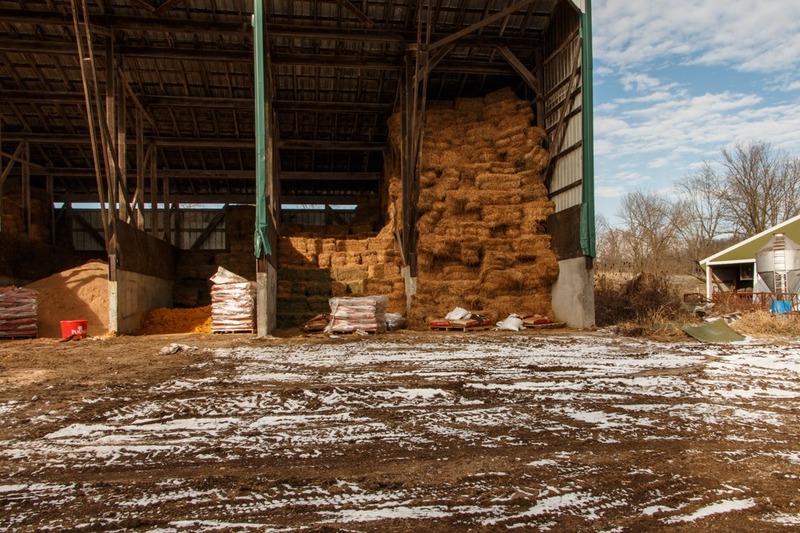 I was impressed by this massive shed and the huge stacks of bales of hay. Rectangular hay bales are simply not popular here in Ohio, so to see so many of them in such a huge bin was rather interesting. I am afraid that this photograph does not do true justice to all the junk that was in the yard of this run-down house. 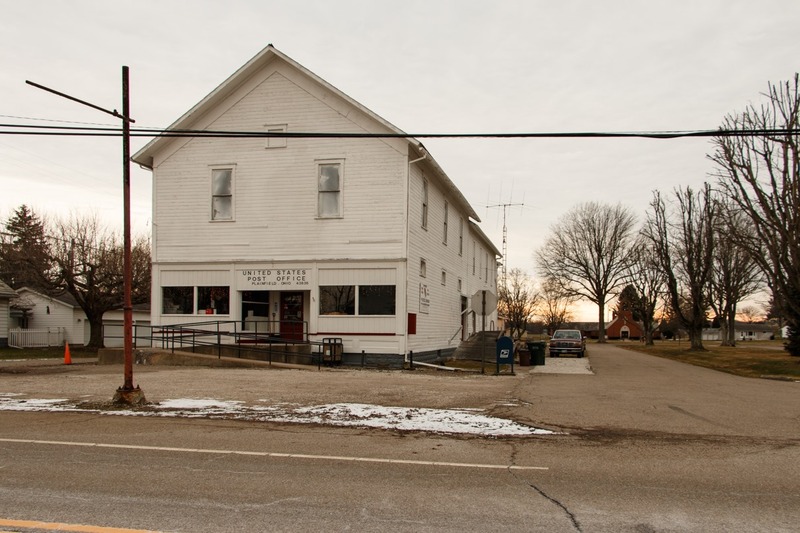 Here we see some ancient commercial establishment in Cambridge, Ohio, rather the worse for wear at the moment. I can’t divine what the original purpose of this building was. I have visited Cambridge, Ohio, before. 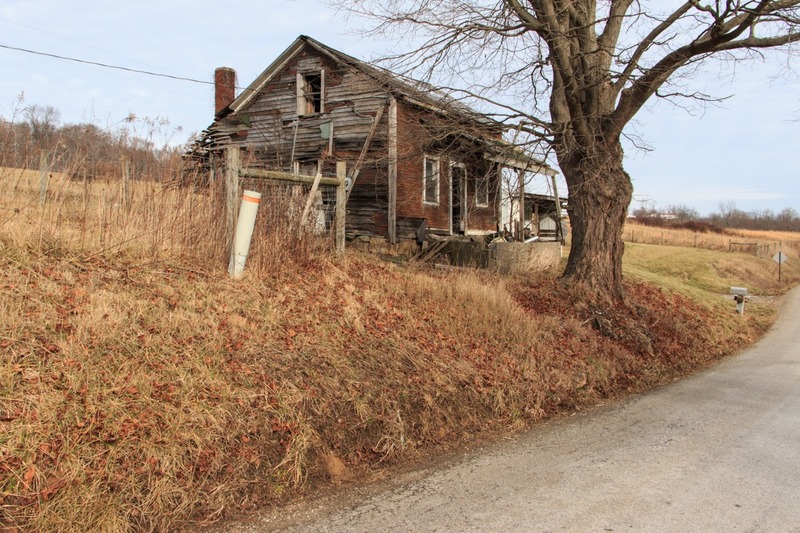 This town of 11,129 (salute) is only about 2/3s the size today that it was at its prime, in 1930, and has suffered from eight straight decades of demographic decline. 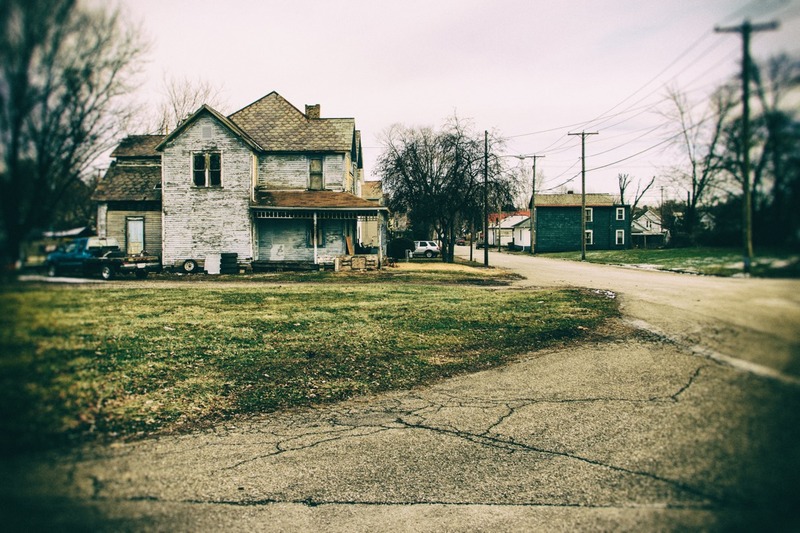 Sadly, it is a fairly poor town as well, with nearly a third of the population living below the poverty level. However, Cambridge has its merits, some of which I was well aware, such as some of the nicely kept old buildings in its historical downtown. 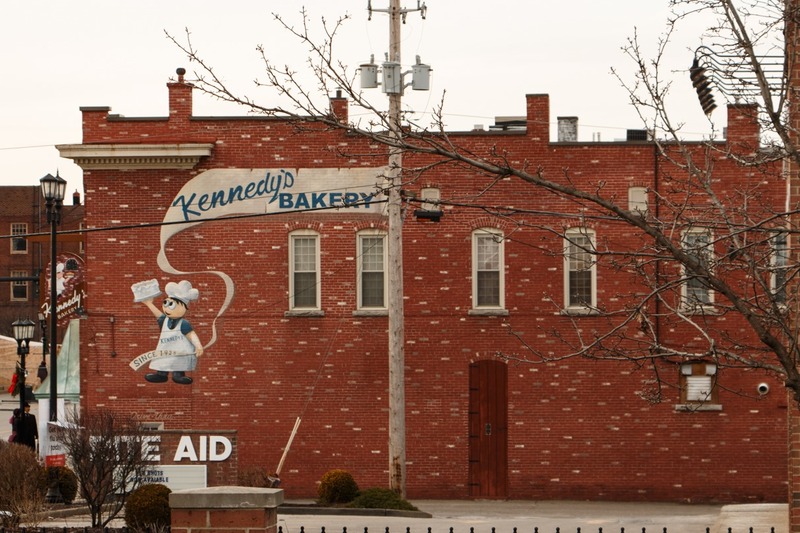 Kennedy’s Bakery has been around since 1925 and is now in its third generation. One extremely cool thing about Cambridge I did NOT know about, because I had never visited the town at Christmastime before. This meant that I had never encountered “Dickens’ Victorian Village,” which has been a “thing” in Cambridge between November and January for close to ten years. 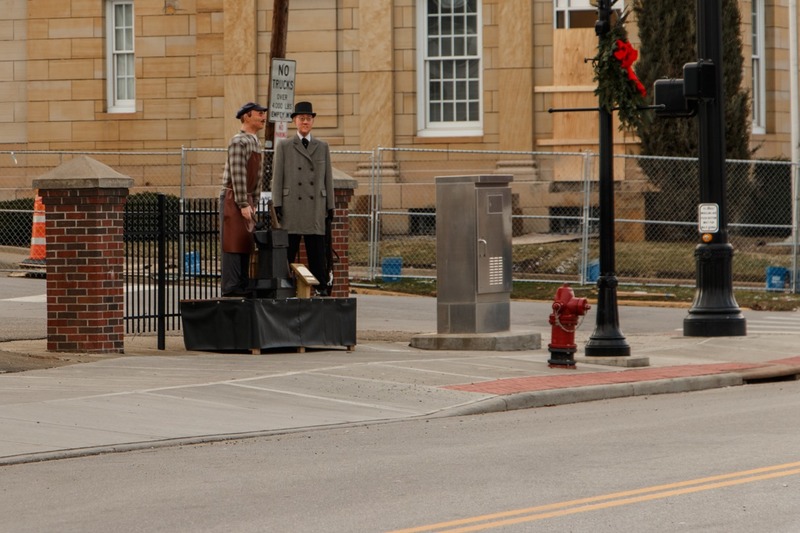 During this time period, the streets of Cambridge are filled with life-sized dressed mannequins reenacting homey scenes or poses from Victorian-era England. Almost 90 such little scenes grace the stretch of U.S. 40 that runs through downtown Cambridge. 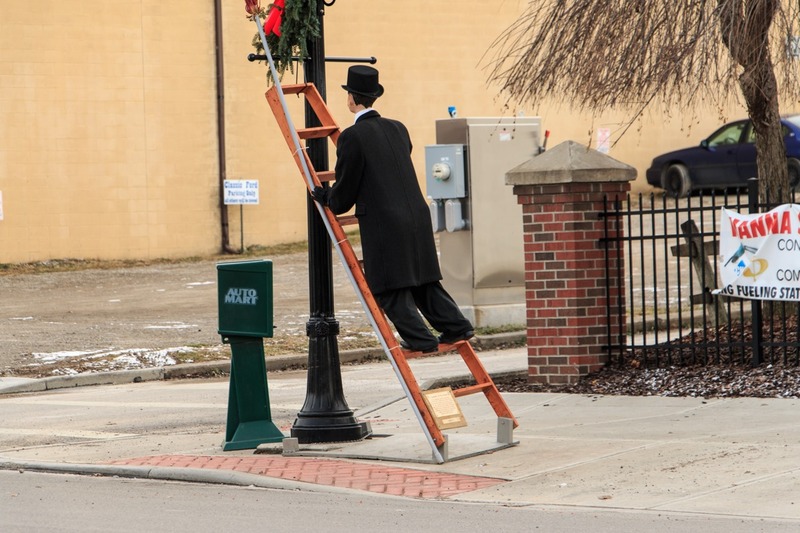 One can see Bob Cratchit, a bucket brigade, holiday carolers, and more. Local artist Bob Ley thought of the idea and sketched out the various scenes, while other artists sculpted and painted the individual heads of the mannequins and volunteers built and clothed them. Turning a corner only to see such unexpected and interesting scenes was something that I must admit made a great impression on me. 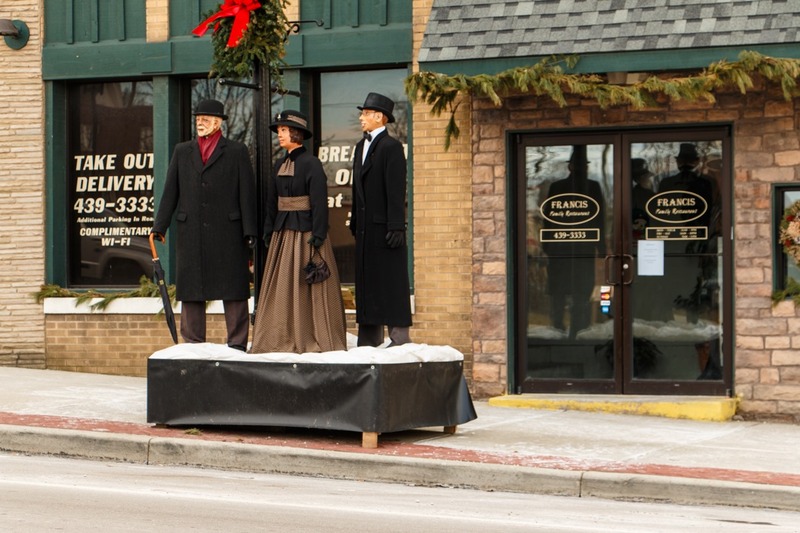 They made the whole town seem cheery and festive—and it was also remarkable that so many people would come together to create a special thing like this. I would have liked to have shown more scenes here, but too many other images did not turn out well—I was learning my new camera, and the bitter cold had caused me to try handholding the camera rather than using the window mount, with the result that a number of photographs had blur. So my photographs don’t really do Dickens’ Victorian Village the justice it deserves, but I for one was delighted by it. Here’s something else that filled me with good cheer about Cambridge. 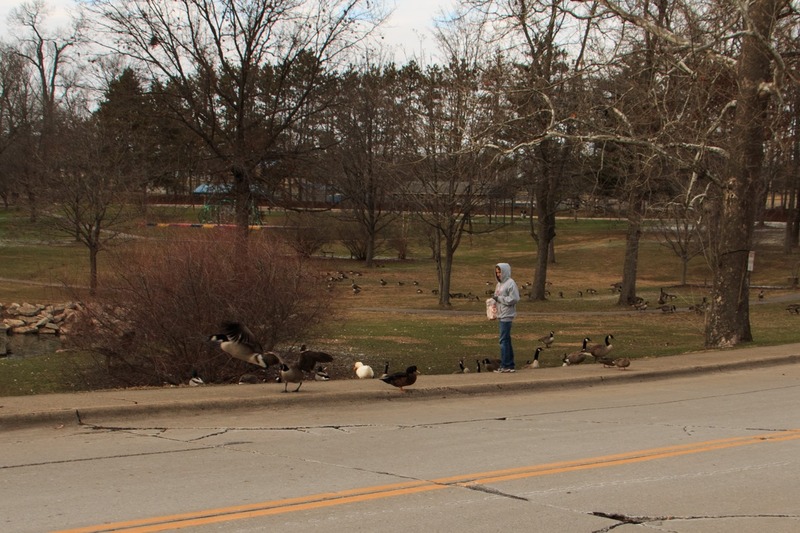 This thoughtful woman had not forgotten about the ducks and the geese in the local park on this Christmas day and came outside on this cold, cold day to make sure they had a little something in their stockings, too. After going through Cambridge, I began to head back, through pretty heavily wooded Guernsey County. 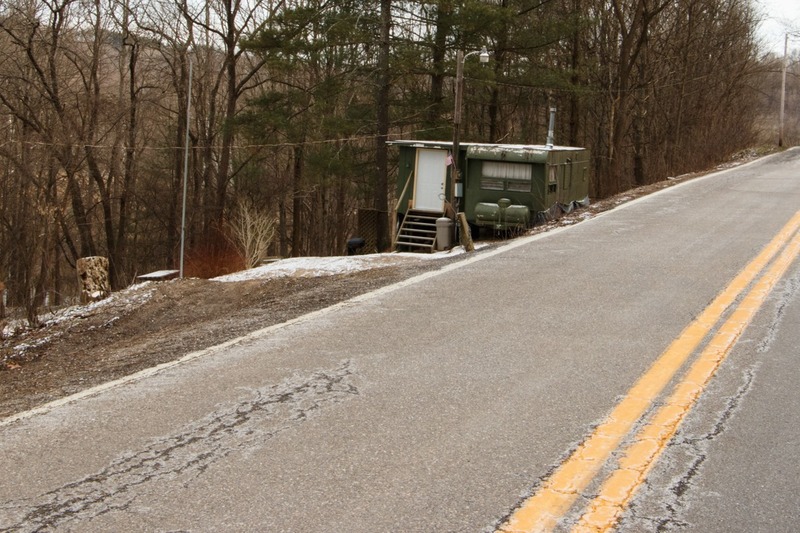 Along the way, perched next to the road on the edge of a steep slope down to a creek below, was this structure. I have mentioned before how fascinated I am by these hybrid structures that combine cabin and travel trailer and this was a perfect specimen. 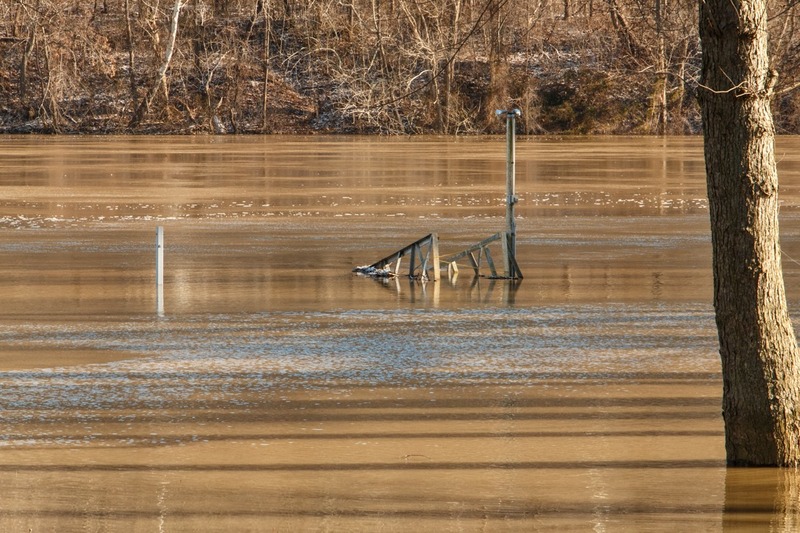 The temperature was low enough that shallow flood waters were often frozen over. as in this low-lying area. I was quite taken by this place, with its green roofs. The sign, which features Merino sheep, reads “Roahrig Farms,” which I found a bit confusing, because all of the Roahrig Farms references I found all were in Indiana. 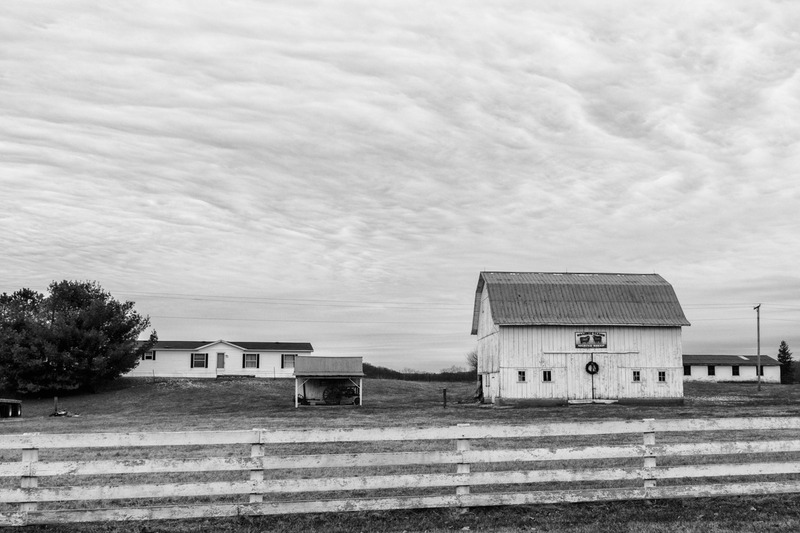 In black and white, we don’t have the pleasing green roofs, but the texture of the sky adds greatly to the scene. This was a rather massive building for the post office of Plainfield, Ohio, population 157 (salute!). 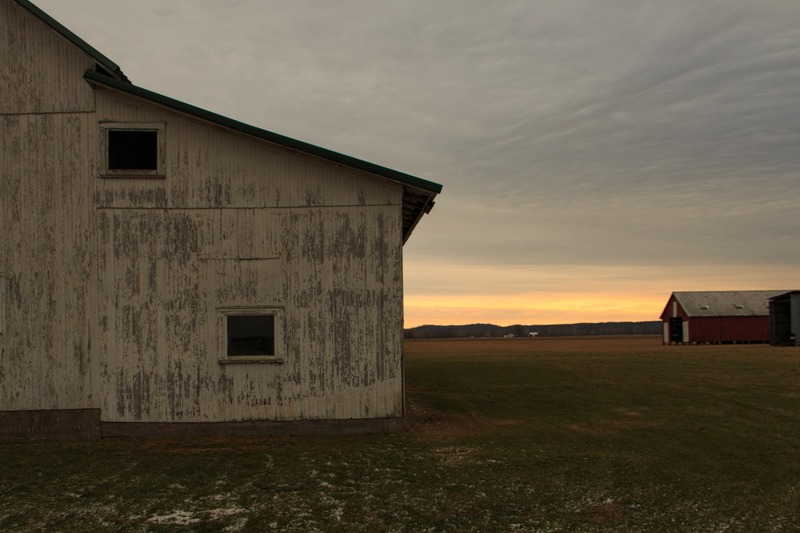 We saw the sunrise against an Ohio field and barn in the last blog entry. Now we see the sunset. Merry Christmas to all, and to all a good night.